While front end development tends to get a lot of attention, we’d like to shed some light on the developers and engineers who work behind the curtain to ensure that the website or application you’re seeing is firing on all cylinders. Back end developers play a critical role on Kenzan teams, managing and building everything from servers to databases and all the things in between. To learn a little bit about what it’s like to be a Back End Developer, I spoke to one Kenzanite, Nicholas Sledgianowski (aka Sledge), who’s been at Kenzan for 3 years and works out of our Denver office. If you’re interested in joining our team of back end developers and are in the Denver area, RSVP for our Back End Developer Job Fair on December 13. For those that aren’t in Denver, please visit our careers page for more information on our open positions. I have worked as a software engineer for around 5 years with exposure to both the front and back end of websites. My original plan was to be a physics researcher but I switched to software during my college years. I live in Denver and enjoy hiking and ballroom dance. In high school I tried to get into game programming with C++, I did not get very far but I took an introductory C++ class in college that got me hooked on programming. What kind of projects do back end developers work on at Kenzan? My favorite project was a data pipeline we built to provide a unified user data layer on top of 3 legacy user databases. The client had undergone a merger and was moving all users onto a unified site. We had a Kafka topic which the legacy systems published changes to, then an Akka cluster handled denormalizing the data and writing it to a Cassandra database. I got to spend some time optimizing our Cassandra driver’s write throughput which was a blast! My favorite programming language is Clojure. It is really beautiful to work with and has very powerful abstraction and polymorphism features. Clojure is not the best language for web development but it is great in other contexts. I recommend checking it out whether or not you have played with Lisp before. What technologies are in your tool box? What’s a new technology that you’re psyched about? I am pretty excited in GRPC and its multi-language compilation capabilities. Other than that I want to try and build things with all the machine learning APIs we have available nowadays. What qualities do you think make you a good back end developer? I am really good at reading which helps because there is a lot of code in a typical project and if you really want to know what is going on you need to read a lot of it. Code is written by people and you can get an idea of what patterns and thought processes went into a program from reading it. What’s the best piece of advice you’ve received at Kenzan? I think the best advice I have gotten is to use the dependency management tools in Maven and Gradle (ex. mvn dependency:tree) to help you figure out tricky dependency conflicts. Without that you can get stuck for days trying to work dependencies out. My best piece of advice is to read the book The Phoenix Project if you want to understand project managers, it is like fables for project managers. To see other open positions at Kenzan, visit our careers page. As technology continues to evolve at rapid pace, it’s more important than ever that companies play an active role in the development and education of technology professionals. After all, we’re looking at 1 million technology jobs by 2020 and not enough skilled workers to fill those roles. Internships are a tried and true approach to engage students, recent graduates and new-to-the-market job seekers as they begin their careers. Three times a year, Kenzan hosts interns at our Denver and Rhode Island offices for 10 weeks. These internships provide hands-on experience with new technologies, an opportunity to collaborate with development teams, and to learn from industry veterans. Before he ended his summer internship, we were excited to hear from Jacob Brauchler, a recent graduate from the University of Colorado. During his internship, Jacob worked with the Platform teams in our Denver office. Kenzan’s training and development manager, Kate Pisano, asked Jacob a few questions about his summer at Kenzan. We’ll be accepting applications for spring interns in October. For those ready for the next step, check out our job opportunities here. You’ve spent 10 weeks with us at Kenzan, can you tell us about the project you worked on: A big project that I worked on was an evaluation of monitoring tools for Kubernetes. I tested the ease of setup along with confirmation that the metrics provided by the system match, at a minimum, the metrics provided by Heapster with InfluxDB and Grafana. I performed this evaluation on five different monitoring tools — Prometheus, Netsil, SignalFx, DataDog and Sysdig. At the end of my project, I wrote a white paper that included all my findings and provided rankings of the different tools based on setup, pricing, metrics and features provided by the tools. What was your favorite part of the internship experience? My favorite part of the internship experience has been learning and working with cutting edge web development frameworks. It’s been really awesome looking at the capabilities of new technologies that successful companies are using, and all with a very knowledgeable team to provide support in the growth and understanding of technologies. Jacob Brauchler, one of Kenzan’s summer interns in Denver. What was a challenge you had to work through? Trying to setup Sysdig to test against the other monitoring tools I was evaluating was a real challenge. I attempted the follow the instructions provided by Sysdig, but along the way I encountered a number of errors. The first issue I found is that Sysdig can only be run on a Linux machine, and therefore I first tested on VirtualBox which does not support nested virtualization and would not work with Minikube. My next plan was to test on a dual booted machine which also ended in failure due to the fact that Sysdig had not been tested with Minikube and did not work due to the inability to update the Linux-Headers on the vm. At this point due to the fact that the other tools were successful and I had many struggles with Sysdig it was determined that Sysdig was not a tool we would recommend using. What was the most important skill you learned during the internship? Honestly, I would say the most important skill I gained during the internship would be the ability to share the process in which I completed a task; it helped me develop my technical teaching and sharing skills. As an extension to that I would say my ability to research and find solutions and to learn new things grew. What surprised you about working at Kenzan? The thing that surprised me about working at Kenzan most is how involved they keep their interns. In my past internship, they kind of just said, “hey go do this” and I was on my own. Here, it was a great experience where I was a part of a team doing work that is helpful to the company and pushed me to grow as a developer. Favorite snack in the office? My favorite snacks in the office were probably the different desserts in the office, such as cookies, ice cream and ice cream sandwiches. What was your favorite timesheet giphy Kate sent? My favorite timesheet giphy Kate sent, was the guess what day it is gif. I choose this gif because it provided a fun time to joke around with other interns, as well as Kate. What piece of advice do you have other folks looking at internship opportunities? One piece of advice I have for other folks looking at internship opportunities is to find an internship that wants you to be involved with the team, and wants to help you grow as a developer. If you find a company that wants to do this and wants to prepare you for a future in this industry you will get a lot more out of your time. What new tools or tech were you exposed to or got to work with? The tools and technology I was exposed to were Kubernetes (an open-source system for automating deployment, scaling, and management of containerized applications. ), Prometheus, SignalFx, DataDog, Netsil (The past 4 are monitoring tools), Jenkins, React, and Webstorm. I got exposure to a wide variety of tools and tech during my time at Kenzan, some on the development side of things and some on the DevOps side of things. How did the experience guide your career goals? This experience guided my career goals in that I started out with a focus on just being a fullstack developer but after my time as an intern I would like to have the opportunity to dive into DevOps further in the future. 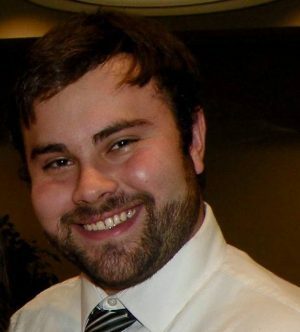 After completing his 10-week internship, Jacob was hired as a full-time employee. As the tech skills gap grows and more IT roles remain unfilled, the search for top tech talent has never been more competitive. Companies are upping the ante with perks like yoga classes, nap pods, free meals, unlimited vacation days and more in order to attract and retain employees. 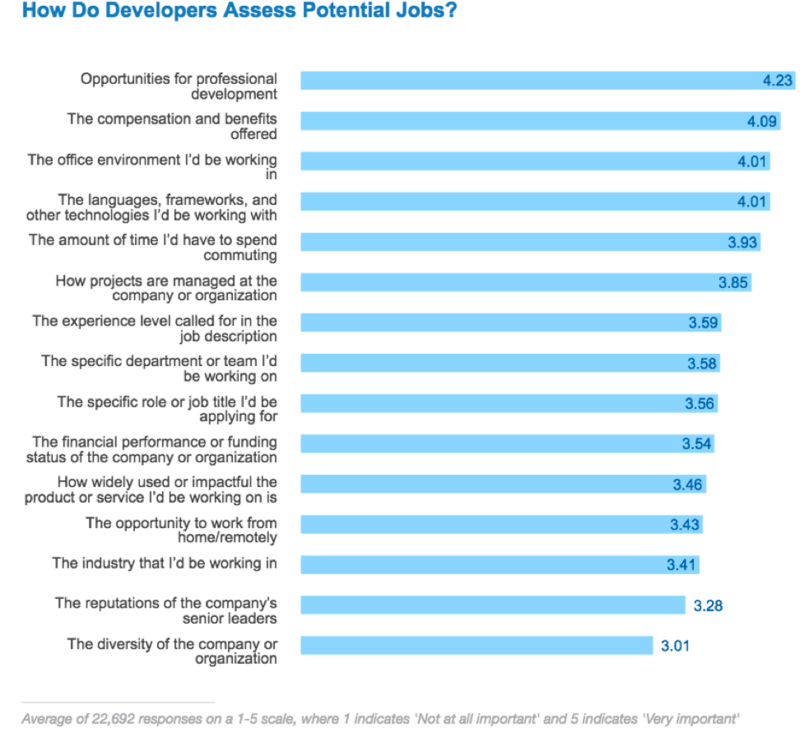 But according to Stack Overflow’s annual developer survey, there is one factor that potential employees in the tech sector value more than anything — even more than pay and compensation — and that’s opportunities for professional development and continued learning. The response from more than 22,000 developers that Stack Overflow asked shouldn’t come as a surprise to anyone who has ever worked with developers and programmers. With 90% of the survey’s respondents also stating that they are at least partially self-taught, it’s clear that the industry is a community of learners. Many of our leaders have been self taught and driven by pure passion for technology — Steve Jobs, Bill Gates and Mark Zuckerberg all famously left prestigious universities in their pursuit of technological innovations. Investing in continued learning and education isn’t just a good way to attract new talent, but can also be used as a tool to keep current employees engaged, productive and feeling empowered — making them less likely to take their skills elsewhere. The impact of disengaged employees can be staggering, affecting everything from staff retention to morale to a company’s bottom line. Gallup estimates that a disengaged employee costs an organization about 34% of their salary per year, but re-engaging these employees offers an opportunity to improve performance, profitability and customer experience. At Kenzan, continued development and learning is not only a big part of our culture, but part of our business. As a software engineering and digital consulting firm that is tasked with helping clients make the most out of technology, it’s crucial that our teams stay current on the tools and tech that are leading the industry. Develop a continuous feedback loop of learning. Managers who recognize progress, tangible goals, and teach-back opportunities will have stronger relationships with their reports and a clear roadmap for their team. Provide a structure for training requests. A clear process allows all staff to understand what is considered a reasonable request and that requesting training is not considered self-serving. Providing structure opens the door for new or shy team members to take opportunities because they know it’s appropriate and valued. Share a clear strategic vision with your team. Most employees want to make sure their training aligns with the organization’s future. Setting the goal posts gives employees the agency to plan their path forward. Implement a way to track skills and progress. Tracking progress means you value the effort that your team is putting in. Unless the team prioritizes training the way you approach other tasks, it will always be at the bottom of the list. At Kenzan, we’re developing a Badge Board to assess team members’ skills and growth based on the organization’s goals and technical vision. Encourage developers to manage up. Respect your supervisor’s time. Follow set procedures and follow up with your needs. Even the most thoughtful, learning-minded supervisor is going to forget about the registration deadline. It doesn’t mean they don’t want you to go, but just that they probably had a few fires to fight this week. Be Flexible. Sometimes your request will be denied, perhaps due to timing or cost. If this is the case, there is likely another resource that offers growth in this skill, but is less expensive or time bound. If the no is because your supervisor doesn’t see a connection to your learning goals or a value to the organization, make sure you’re continuing the conversation to align your goals with your company’s strategic vision. Whether your goals are in recruiting, employee retention or tied directly into business drivers, the value that learning and development brings to an organization is clear. Far too often professional development is overlooked, and far too many talented employees leave a company because their success is stymied by lack of support. Kate Pisano is the Training and Development Manager at Kenzan, based out of our Rhode Island office. She is responsible for managing Kenzan’s internship program and supporting Kenzanites through continued learning opportunities. With a background in AmeriCorps and program development, Kate’s always excited to help team members grow and advance.